Bearing Technologies, Ltd., engineers, manufactures and private labels premium wheel hub assemblies, clutch release, drive shaft center support, racing, axle repair and specialty industrial bearings. With over 20 years in the automotive aftermarket business, Bearing-Tech stands alone as the largest manufacturer of premium aftermarket hub assemblies in the USA. Our track record for quality, service, and dependable delivery has enabled us to enter into the OEM and OE Service markets. Bearing Technologies manufactures and exclusively supplies drive shaft center support bearings at the OEM level. 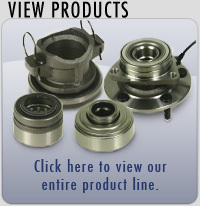 Additionally Bearing-Tech is a supplier to the OE Service market for hub assemblies. Our mission is to supply high quality products for an affordable price.